Note: You can enter this giveaway two (2) times per e-mail address per day. Deadline is 11:59PM ET 4.20.19. 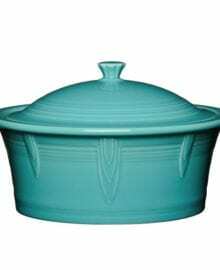 This Fiesta Large Covered Casserole is so versatile you’ll be using it day after day. It comes in 11 different colors, so you can get one to reflect different moods, seasons or cuisines. The dish is lead-free, microwave and dishwasher safe, oven proof and comes with a 5-year chip replacement warranty. It looks so good, you’ll want to serve all your meals in it. A spaghetti primavera pie is an amazing supper, loaded with pasta, veggies and cheese, that will look deliciously lovely in your new casserole dish. NO PURCHASE NECESSARY TO ENTER OR WIN. Void where prohibited by law. Open to legal residents of the 50 U.S., D.C. and Canada (excluding Quebec) who are at least eighteen years old at the time of entry and have internet access. Begins on 2.23.19 at 12:00:00 a.m. ET and ends on 4.20.19 at 11:59:59 p.m. ET. To enter the giveaway, submit your full name and email address on this form. Odds of winning this giveaway depend on the total number of eligible entries received. Only two (2) entries per email address per day. Sponsored by Leite’s Culinaria, Inc. For more information, visit our Official Rules. Be sure to add giveaways@leitesculinaria.com to ensure notification if you are the winner.